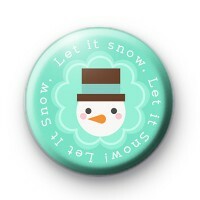 How fun is this bright blue Snowman Badge It also has the festive saying Let It Snow around the edge. It's a cute Christmas badge and would look sweet pinned to your school bag or on a Christmas card. Let's hope we have a white Christmas so we can build a snowman. Make sure you take a look at our Christmas badge category as we have hundreds of Holiday themed badges to pick from.